So far, they have found fragments of hearths, pieces of burnt animal bone, iron slag and charcoal. Mr Mytum, director of the Centre for Manx Studies at the University of Liverpool, said: "Port y Candas was probably the home of a powerful leader who was able to mobilise resources to create a settlement in this location, and then support the craftsmen who would have worked making tools, weapons and bronze jewellery for him, his family and his band of supporters. "The evidence from the current excavations suggests that iron working was the main activity in this part of the site; the small round houses where the inhabitants would have lived were excavated by Gelling in the centre of the settlement." The site was first looked at by Peter Gelling in the 1970s and 1980s but he died before the work was complete, Mr Mytum said. 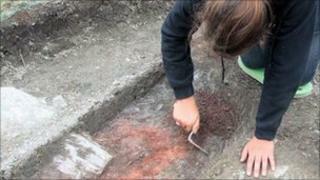 The new team's finds will be exhibited in the Manx Museum, alongside items found previously.